Lord Nityananda (also known as Nityananda Prabhu, Nitai, Nityananda Balarama) appeared as Lord Chaitanya’s principal associate for spreading the congregational chanting of the holy names of the Lord. He especially spread the holy name of the Lord throughout Bengal. 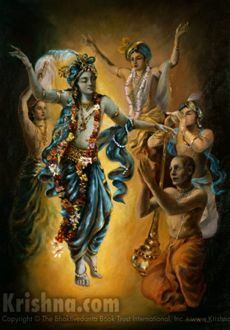 He is considered an incarnation of Lord Balarama. Devotees of Lord Nityananda celebrate by fasting until noon, cooking a feast, and chanting the glories of Nitai. Pastimes of Lord Nityananda—Lord Nityananda’s Pastimes from the Sri Chaitanya Bhagavata, by Srila Vrindavan Das Thakura, narrated by Harinam Chintamani dasi. 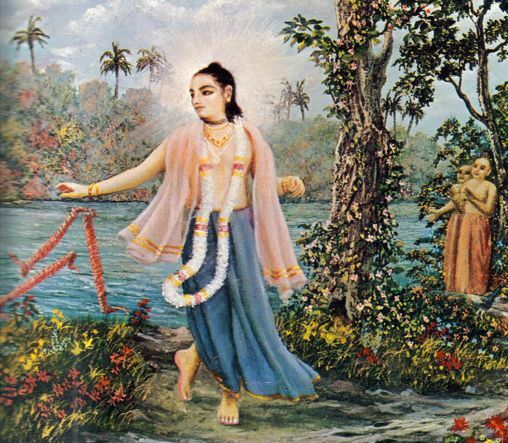 The Most Merciful Lord Nityananda, a blog post from Karnamrita Dasa. Although posted in 2009, this blog post can be very inspiring for your own spiritual journey. Nityananda Prabhu and Advaita Acarya, from the series Lives of the Vaishnava Saints, Chaturatma dasa shares with us some pastimes of Lord Nityananda.